"Where was Moses when the light went out? Where was Moses-what was he about? Now my little man, tell me if you can. Where was Moses when the light went out?" For naughty ghosts at my bedside glar'd at me while they scream'd:-Cho. And didn't she warm my jacket when I innocently said:-Chorus. Some twenty years passed before I heard the phrase again. We rushed into a tunnel, and when all was pitchy dark. My lively little lady friend gave vent to this remark:-Chorus. We're married now, and six fine boys amuse us every night. 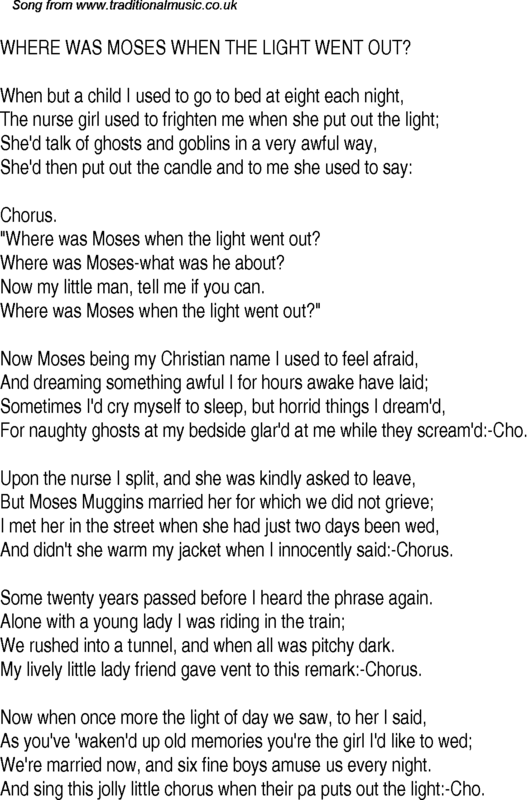 And sing this jolly little chorus when their pa puts out the light:-Cho.